The story of American Pillar Nursery is one of romance, hope, and determination. Mavis Houser and her late husband John started their business in 2009 specializing in their patented ‘American Pillar” Arborvitae. Mavis and John met in 2004 at Woodstock First Baptist Church’s Tuesday morning bible study when Mavis was 76 and John was 80. The two fell in love immediately and married less than a year later in 2005. Their arborvitae has achieved about as high acclaim as a nursery plant can achieve, being awarded the Proven Winner® recognition from the Spring Meadow Nursery. The American Pillar Nursery has customers from Georgia to Michigan. Mrs. Houser stands in front of a screen planting at American Pillar Nursery. The screen is approximately 7 years old. I moved here about 17 years ago from Roswell. Gospel and choir. I sing with the “Pebbles” singing group with First Baptist of Woodstock. We will sing for people at nursing homes in the area. I listen to tapes of history and mystery themed books. Things you enjoy after work? John grew up on a farm in Illinois and worked his whole life as a nurseryman, grower, and landscape installer. When we married he had a small nursery off highway 20 and one day he visited the nursery after he had been away from it due to illness and noticed a sport of a ‘Hetz Wintergreen’ arborvitae that was uniquely different. John noticed the sport had qualities that made it unique from the parent plant in that it had more dense foliage and its spread was narrower. So at the age of 83 he set out to patent the plant as the ‘American Pillar’ arborvitae and we began our nursery to grow and sell our tree. To go back and see our trees growing and performing well. I love receiving feedback from our customers on how well the trees have done for them. 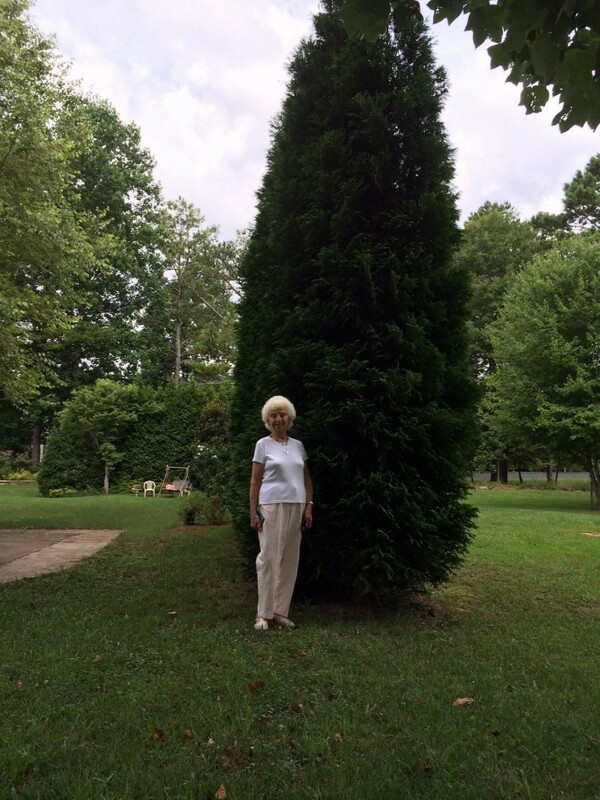 Mrs. Houser displays the verdant foliage of their ‘American Pillar’ arborvitae. The tree makes an excellent screen and habitat for birds. Posted in Cherokee County, Conifers, growers, local business, nursery, Trees. 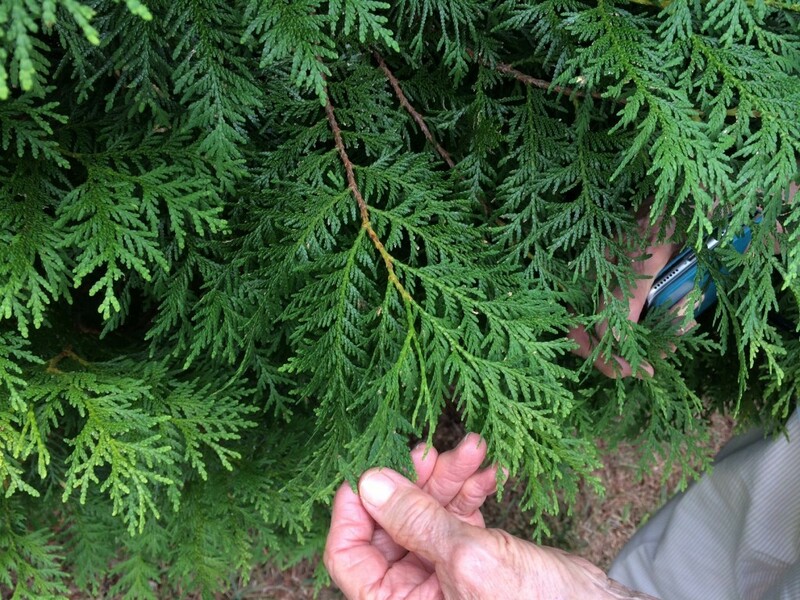 This entry was tagged arborvitae, screening plants. Bookmark the permalink.